Software products are not visible, you cannot touch or weigh them. However, they are sold because they do their work. Moreover, it’s hard to imagine our today’s work without program tools like Microsoft Office, as they become a real platform for business and entertainment. One of the key tasks of any company is an information management, data storage and document sharing between employees of a company. This is where our service SYNCING.NET can help. Its main feature is the Outlook synchronization without Exchange server and the file sharing without the use of third parties Cloud services. SYNCING.NET is used as an office communicator already for 10 years. For example, the synchronization of Outlook contacts between multiple PCs in the office or at home is an easy task for SYNCING.NET. So you can share Outlook data and documents with business partners or family members. Microsoft Outlook is not just a regular email manager. It is widely used for business communications. Each of its features is well thought. However, it lacks of synchronization features between multiple devices like Outlook calendar sync, Outlook tasks sync or contacts sharing. SYNCING.NET fills in this gap and makes Outlook sync in a multi-user environment easy. For example, the synchronization of a particular calendar with your colleagues at the office can be a very important task. It is very tedious and error prone to manually manage corporate events on every employee’s PC, as some of the important events can be simply lost or overseen. SYNCING.NET performs calendar sync with Outlook seamlessly and can update all events across multiple desktop computers or mobile devices with ease automatically. With SYNCING.NET you don’t need to manage your calendars or contacts manually using USB-sticks or other media anymore. Information is the most valuable resource of any company. Big corporations have special IT department for data protection. However, small and medium companies cannot always afford having IT staff for that purpose. This is where SYNCING.NET can be very useful. SYNCING.NET can significantly reduce IT and administration costs in a company. SYNCING.NET is very easy to use and can be configured by employees without special IT-knowledge. SYNCING.NET does automatic Outlook and file synchronization across diverse desktop Windows, Mac, Linux computers and mobile devices iOS, Android, and Windows Phone. Currently, on Mac and Linux computers and Windows Phone only file synchronization is supported. High security standards with multi-level encryption. Easy and clear user interface. Supports proxy-servers and a big number of users. Outlook sync and File sharing are possible even without Internet connection. SYNCING.NET editions for Business and private customers. 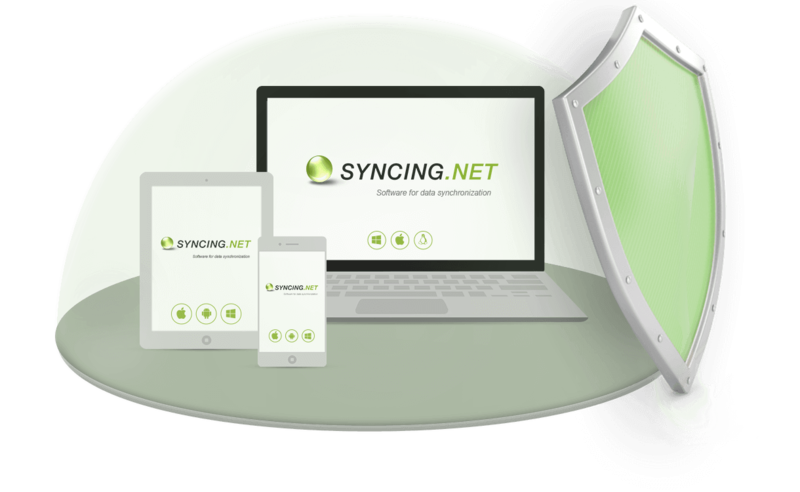 One of the key feature of SYNCING.NET is a data sharing without cloud services. SYNCING.NET also does not require additional hardware or software, and IT-administration. Data synchronization works in the background using an advanced peer-to-peer (P2P) technology. SYNCING.NET offers several editions for different groups of users. 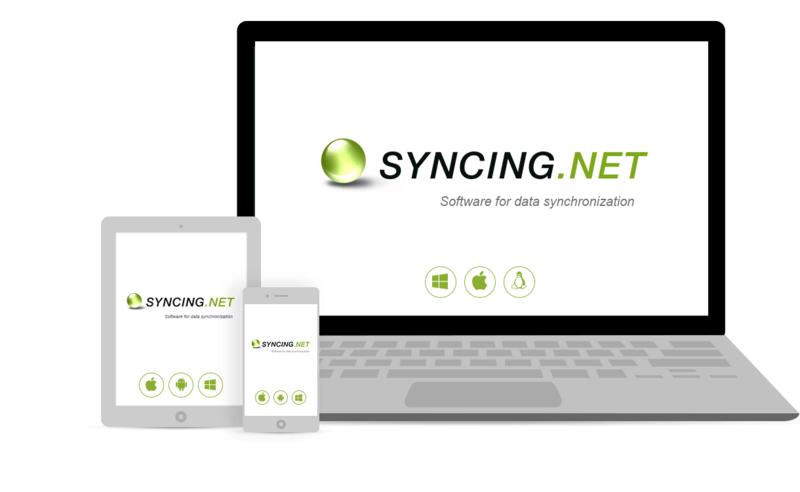 The SYNCING.NET Business Edition was designed for companies and workgroups and allows data sharing between different SYNCING.NET users. 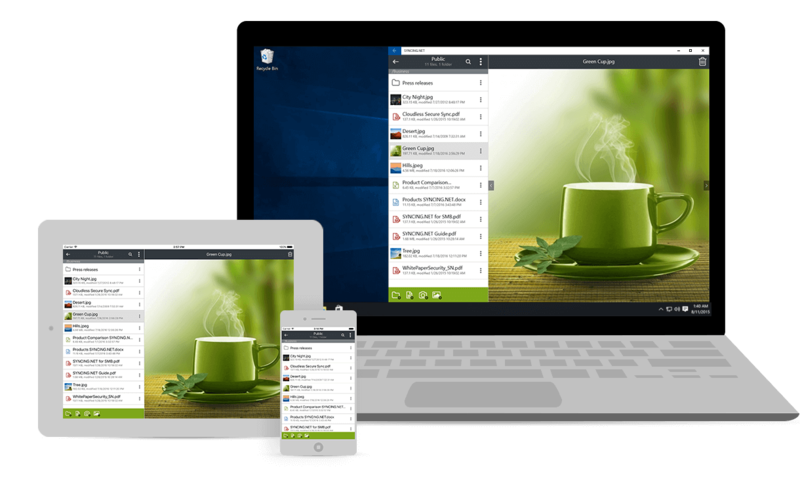 Outlook and Files synchronization works in enclosed groups with up to 50 users on desktop and mobile devices. With the SYNCING.NET Business Edition you can easily create and manage a common Inbox, Outlook synchronizing folders or a shared Address Book for the whole company. All your data is available anywhere and at any time, as SYNCING.NET stores copies of data locally on each device. SYNCING.NET does not require additional servers, network equipment or IT-administrators, and, thus, significantly reduces IT costs. The Syncing.NET Personal Edition was designed for private customers. It has many synchronization features, for example, you can easily share documents and sync Outlook between two computers at the office and other place. SYNCING.NET significantly simplifies data synchronization and spares time, as many manual ways of data copying using USB-sticks, emails, or other media are not required anymore. Sync Outlook on two computers with SYNCING.NET seamlessly. Both Editions of this product allow you to sync different Outlook data, for example, sync Outlook email, sync Outlook contacts, share Outlook calendar without Exchange, synchronizing subscribed folders Outlook 2013, 2016 or other versions, etc. SYNCING.NET has very low system requirements and can be used even on old computers. The installation and configuration are very easy. If case of any problems, the SYNCING.NET team is always ready to help you. SYNCING.NET offers also other useful products, for example, Outlook Backup software or a tool to sync Outlook to Google. Please visit our website for more details. Some editions are freeware! Our products is a virtual ware, but commercial companies and private customers knows its real value. New digital products and apps are being constantly developed by IT-companies and used by many customers around the world. So SYNCING.NET became an essential part of a business process at many companies. 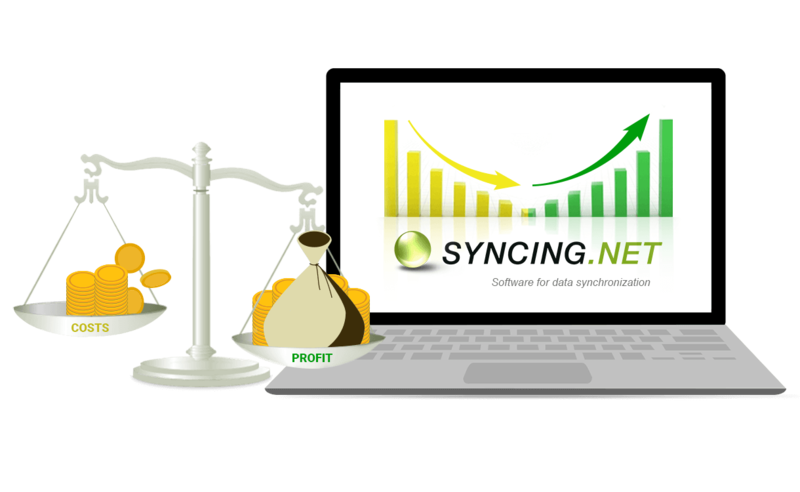 We encourage you to try all SYNCING.NET benefits. SYNCING.NET allows you to synchronize Outlook and documents between multiple devices without the use of a dedicated server. Cloudless, real-time, automatic synchronization is carried out via internet access and can function online or off. Outlook sync between devices functions using highly encrypted peer-to-peer networks. All current synchronization programs are Outlook 2016, Outlook 2013, Outlook 2010, Outlook 2007, Outlook 2003, (32- and 64-bit) compatible. Syncing Outlook has never been easier! Whether it is a desktop computer at the office, a laptop at home, a mobile device at any other place, SYNCING.NET makes you certain that you have complete Outlook data available anytime and anywhere. Work tasks from your office or colleagues can catch you at any time. You always need to be on top of the game and this goal can only be achieved by having all required data in your hands. Complete Outlook synchronization can help you to have access to your actual e-mails, contacts, calendars, and tasks, in front of you by simply connecting to the Internet. And for the times when you do not have Internet access, the program works offline, as well. For small and medium businesses and road warriors alike, we offer the best Outlook synchronization solutions available. Nothing can stop you from working and staying up-to-date on the go. Let us help you in achieving top performance in your business without any worries. Sync Outlook between desktop computers and mobile devices effortlessly and without a server. You do not need to worry about carrying your data with you on USB sticks or on portable storages. SYNCING.NET can help you to retrieve anything that you want to, with only a simple click. You always have a local copy of your data on all your devices, which are synced automatically in background. In today's fast-paced world where all people and devices are connected, we simply cannot stay behind. Any mistake can have serious consequences. Therefore, you need to stay up-to-date with the requirements of your job and your position. This can only be achieved by having a single informational database for your valuable data. Instead of having different pieces of information stored separately on desktop computers or mobile devices, you just need to have one solution, which will keep in sync your data on all your devices. When you need to access your contacts or schedule an appointment, you can do this with a few clicks on any device. With SYNCING.NET all tedious tasks become easy. SYNCING.NET is just one solution you need, in order to keep your Outlook data up-to-date on desktop computers or mobile devices. Synchronize contacts between your desktop computers, notebooks, and mobile devices. Share business Outlook contacts between your colleagues at work, or sync personal contacts with your partners and family members. You do not need deal with different copies of contacts stored on your mobile phones, tablets or computers. As you can find all of them in one place, properly synced and updated, you can share them with other persons with ease. Our software solutions are very flexible and allow the individual data management. We understand that one solution cannot work for every type of data. Therefore, we have provided top-notch data management solutions. All your contacts with an attached information like a title, a position, a location, etc. can be easily created, modified or deleted on any device. The SYNCING.NET User Rights Management helps you to control what Outlook data you wish to sync and with whom. Optimize data exchange for you, your company and your clients. Keep Outlook appointments up-to-date on multiple devices automatically. Sync your events and meetings with your own desktop computers and mobile devices, or share Outlook calendars with colleagues. Real-time synchronization ensures that newly created events are always available for all participants within your closed user group immediately. Instead of having to manually change the dates or update events, a single change on one device can simultaneously update calendars of all other members. 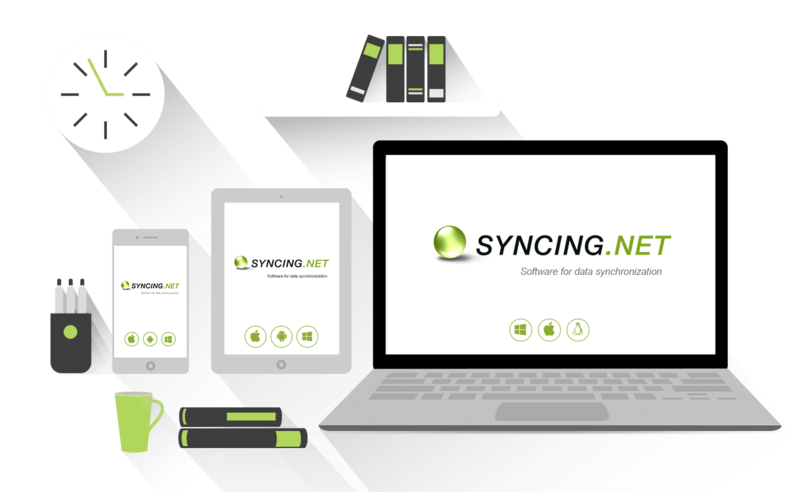 With our SYNCING.NET Business Edition, we offer businesses a powerful solution that ensures optimal team communication, without the big budget drain of servers and IT maintenance. You cannot lag behind your competitors and call every member of your team individually. If an emergency meeting or an event is created, everyone must be on board with you. SYNCING.NET updates Outlook calendar automatically on all desktop and mobile devices for all participants in your network. With our Outlook calendar synchronization software for every member of the team - on site or off, you will always be one step ahead of others. Outlook and file synchronization made simple!